To comply with State regulations, the Village of Phoenix, will be annually issuing a report describing the quality of your drinking water. The purpose of this report is to raise your understanding of drinking water and awareness of the need to protect our drinking water sources. Last year, your tap water met all State drinking water health standards. We are proud to report that our system did not violate a maximum contaminant level or any other water quality standard. This report provides an overview of last year’s water quality. Included are details about where your water comes from, what it contains, and how it compares to State standards. If you have any questions about this report or concerning your drinking water, please contact James Lynch, Village Administrator or Mayor Ryan Wood at (315) 695-2484. Residents of the Town of Schroeppel can contact the Town Supervisor, Lynett Greco, at (315) 695-4473. We want you to be informed about your drinking water. If you want to learn more, please attend any of our regularly scheduled Village Board meetings, at which time you can discuss any drinking water issues with them in person. They are generally held on the first Tuesday of each month at 7:00 PM in the Municipal Building located at 455 Main Street, Phoenix. Our water system serves approximately 2,138 people through 913 service connections and has approximately 270 outside users through 84 service connections in the Town of Schroeppel. Our system consisted of two drilled wells until August 2017. Foster Well #1 was 20 inches in diameter and was screened from 40 to 64 feet below grade. Foster Well #3 was 18 inches in diameter and is screened from 51.5 to 68 feet below grade. The source wells were located approximately three miles to the east-northeast of the Village in the Town of Schroeppel. Microscopic Particulate Analysis (MPA) sampling performed by the Oswego County Health Department (OCHD) and by our independent laboratory indicated that Foster Wells #1 & #3 were classified as groundwater under the influence of surface water (GWUDI.) The village water system was in violation of the Surface Water Treatment Rule (SWTR) based on this analysis. Foster Wells #1 & #3 were abandoned to comply with the SWTR, the Village undertook a capital project constructing a pump station and related infrastructure to completion and as a result now supplying its system through the purchase of potable water from the Onondaga County Water Authority (OCWA). Liquid sodium hypochlorite (chlorine) and orthophosphate is added to the potable water supplied by OCWA and is pumped to one 750,000-gallon water tower in the village and one 300,000 gallon tank in the Town of Schroeppel. The New York State Department of Health has evaluated the Great Lakes’ watershed to susceptibility to contamination under the Source Water Assessment Program (SWAP), and their findings are summarized in the following paragraphs. It is important to stress that these assessments were created using available information and only estimate the potential for source water contamination. Elevated susceptibility ratings do not mean that source water contamination has or will occur for OCWA. The Great Lakes’ watershed is exceptionally large & too big for a detailed evaluation in the SWAP. General drinking water concerns for public water supplies which use these sources include: storm generated turbidity, wastewater, toxic sediments, shipping related spills, and problems associated with exotic species (e.g. zebra mussels- intake clogging and taste and odor problems). This summary is based on the analysis of the contaminant inventory compiled for the drainage area deemed most likely to impact water quality at the OCWA intake. This assessment found a moderate susceptibility to contamination for this source of drinking water. The amount of agricultural lands in the assessment area results in elevated potential for pesticide contamination. Non-sanitary wastes & other discrete sources may also increase contamination potential. OCWA provides treatment and regular monitoring to ensure the water delivered to consumers meets all applicable standards. As the State regulations require, we routinely test your drinking water for numerous contaminants. These contaminants include: total coliform, nitrate, inorganic compounds, disinfection byproducts, and synthetic organic compounds. Our system sampled for total coliform, inorganic compounds, nitrate and disinfection byproducts in 2016. 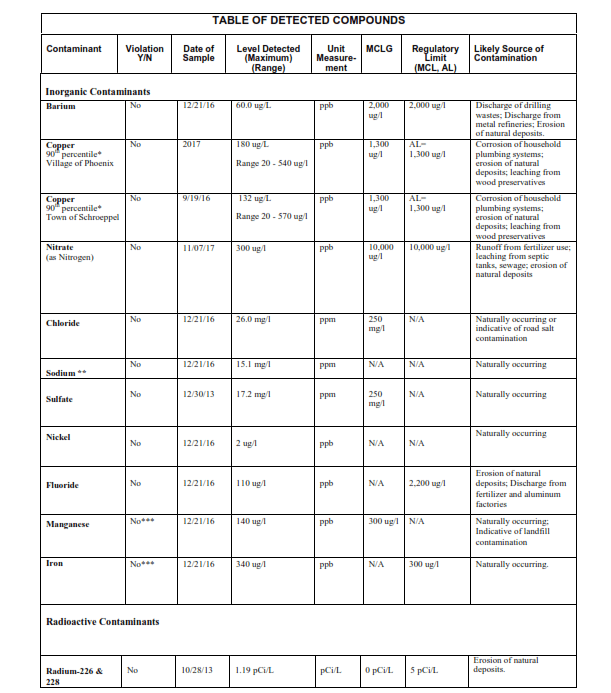 The table presented below depicts which compounds were detected in your drinking water. The State allows us to test for some contaminants less than once per year because the concentrations of these contaminants do not change frequently. Some of our data, though representative, are more than one year old. It should be noted that all drinking water, including bottled drinking water, may be reasonably expected to contain at least small amounts of some contaminants. The presence of contaminants does not necessarily indicate that water poses a health risk. More information about contaminants and potential health effects can be obtained by calling the EPA’s Safe Drinking Water Hotline (800-426-4791) or the Oswego County Health Department at (315) 349-3557. * – The level presented represents the 90th percentile of the 10 sites tested. A percentile is a value on a scale of 100 that indicates the percent of a distribution that is equal to or below it. The 90th percentile is equal to or greater than 90% of the copper values detected at your water system. The action level for copper was not exceeded at any of the sites tested. ** – The level presented represents the 90th percentile of the ten samples collected. The action level for lead was not exceeded any of the sites tested. **** – The state considers 50 pCi/L to be the level of concern for beta particles. ***** – Locational Running Annual Average (LRAA) including sample collected on 2/17/17 was 68.9 ppb. ****** – Lining of elevated water storage tank in the Town of Schroeppel (Oswego County Industrial Park) was re-coated in 2016. Minor detections of Xylene compounds have been detected in samples in the Oswego County Industrial Park since placing the tank back into service. Action Level (AL): The concentration of a contaminant, which, if exceeded, triggers treatment or other requirements, which a water system must follow. Milligrams per liter (mg/l): Corresponds to one part of liquid in one million parts of liquid (parts per million – ppm). Micrograms per liter (ug/l): Corresponds to one part of liquid in one billion parts of liquid (parts per billion – ppb). During 2017, your system was in compliance with applicable State drinking water operating, monitoring and reporting requirements. The Town of Schroeppel did, however, fail to sample for volatile organic compounds (VOCs) within the Oswego County Industrial Park in the first quarter of 2017 and were issued a violation under Subpart 5-1 of the New York State Sanitary Code. The levels of VOCs have remained below the individual MCL of 5 ug/L for all samples collected. Although our drinking water met or exceeded state and federal regulations, some people may be more vulnerable to disease causing microorganisms or pathogens in drinking water than the general population. Immuno-compromised persons such as persons with cancer undergoing chemotherapy, persons who have undergone organ transplants, people with HIV/AIDS or other immune system disorders, some elderly, and infants can be particularly at risk from infections. These people should seek advice from their health care provider about their drinking water. EPA/CDC guidelines on appropriate means to lessen the risk of infection by Cryptosporidium, Giardia and other microbial pathogens are available from the Safe Drinking Water Hotline (800-426-4791). Please note that testing of the water at this system has shown that this water is suitable for drinking purposes and contains very low amounts of contaminants and should not pose any health risks. Spanish – Este informe contiene información muy importante sobre su agua potable. Tradúzcalo ó hable con alguien que lo entienda bien. French – Ce rapport contient des informations importantes sur votre eau potable. Traduisez‑le ou parlez en avec quelqu’un qui le comprend bien. Saving water lessens the strain on the water system during a dry spell or drought, helping to avoid severe water use restrictions so that essential firefighting needs are met. Automatic dishwashers use 15 gallons for every cycle, regardless of how many dishes are loaded. So, get a run for your money and load it to capacity.